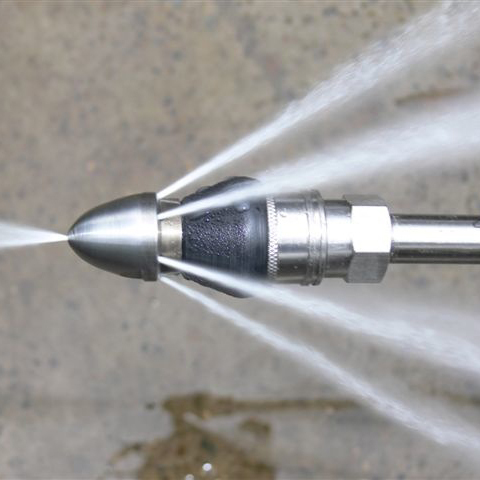 High pressure water jetting is ideal to use in the externals drains and sewers if conventional drain rods cant be used or have failed. We use different types of nozzles for different task ie. breaking down soft silt or hard solid-set blockages, pipe cleaning and removal of fat deposits. High pressure water jetting is very effective but needs professional expertise to be used safely. We use a remotely radio controlled jetting unit with 100 metres of 1/2″ hose than can produce 14 gallons per minute at 3,600 psi and we can carry 1000litres of water. We also 1/4″ hose for smaller tighter pipe work such as rainwater downpipes and traps.